The villages are very simple—a few houses, many without electricity or running water. It has not rained in 2 years in this part of the Gujarat so the ground is dry and dusty. Summer temperatures can reach up to 48°C. It’s a hard life. For several centuries, Gujarat has been one of the epicenters of textile art in India. Some families have been transmitting the trade from generation to generation since the 16th century. Inspired by their surroundings and way of life, each community has its own style, colours, materials. For those in the know, patterns tell the life story of the wearer: his/her community (Chaudhury, Maali, Gardia Lohar, Khatri, Rabari…), lifestyle, profession and social ranking (nomadic blacksmiths, gardeners, landowners, builders…) and of course religion (Hindu, Jain, Muslim, Parsi…). It will reveal whether a woman is young or middle aged; single, married or a widow. We visited the Khatri community, block printing and tie dye masters. The length of the process and the attention to detail required to complete a piece of cloth, is humbling. Below, you can admire the intricacy of the design: there are 4 different block designs, and each design has 4 colour application. 10 steps per yard of fabric. 16 days from beginning to end. The fabric is hand woven, the blocks are hand carved. The dies are hand made from natural materials. The design is hand printed, washed, dyed, dried, pressed. At least 4 communities are involved in the making of a yard. Above the working tables in the artisan’s atelier, I noticed hundreds of boxes lined up on the shelves with unusual numbers of them. They house the pattern drawings of every single design ever created by the Khatri’s family. I was told that we missed the Christian Dior team by a few days. I tried to press Mr. Khatri on his other famous clients but he demurred. How about the Bandhani resist-dye technique? This design of volutes and curves is created by tying thousands of minute knots to resist the dye. It’s an impossible task without hundreds of hours of practice. The 10,000 hours rule has never been more accurate. Men create the pattern, women (working from home) tie the knots which will resist the dye when the fabric is plunged in the vats. 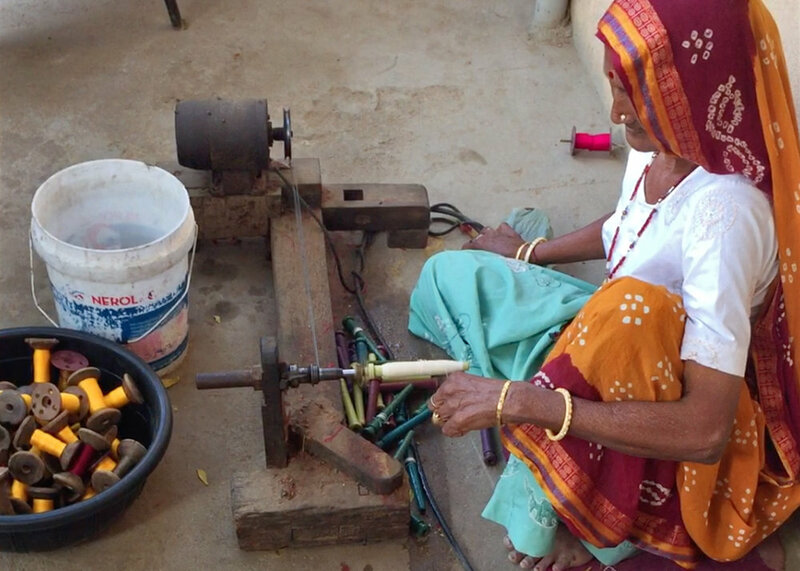 Dried in the sun of Gujarat, the dye will oxidize to reach its final tone. The atelier we visited started with 5 workers 15 years ago. It now supports 250 women and their families. Here, you can see the fabric after the knots have been tied, a video showing men washing the tie dye in large vats, and the amazing finished product. Weaving of the finest cloth is another Kutch art and the specialty of the Vankar community. I loved this pit loom with its long, long threads necessary to weave turban fabrics which can reach 9 metres long. The loom is low on the ground to resist the vibration of the process. So the weaver is sitting on the floor with his legs dangling in a pit—hence the name of pit loom. With the thread spun to the finest grade, a “mere” cotton scarf feels like the most luxurious fabric around my neck. It is light, soft, almost translucent. Did you know that on manual looms the fabric woven is usually no wider than 22”? 22” is the average shoulder width of an Indian man—keeping the width of the cloth to his shoulder width prevents him from having to bend and twist to send the shuttle from one side to the next. And how not to mention Mr. Ravji, one of the last 7 mashru weavers left in the province? His cloth is woven with cotton and silk. Gujarati men are a proud group but they also like their finery. Not wanting to be seen as feminine by wearing fine garments, they wear cloth made of silk on the inside and cotton on the outside. So it’s a double weave, which is insanely complex to realise. Mr. Rajvi’s loom has 2000 threads. In addition to the 11 heddles used to separate the threads, he controls 7 pedals with his feet. It takes 3 days per design to set up the loom. He loves his work and was astonished and proud that some women from Canada bought his scarves. It was very moving. It’s not just the big fashion names who work with these uniquely skilled artisans. Judith Bourdin, the founder of Denovembre, works with the very same artisans we visited. She spends weeks with them several times a year, refining the designs, working on the colors until it is all true to her exacting eye. Many of you own her scarves. I’m sure you are going to wear them with a renewed sense of awe for the art that went into creating them. And if you don’t have one yet, I have a few left on the website for you to enjoy. This trip has been a wonderful opportunity to get to know my friend better and share some pretty hilarious girls’ moments. I will be offering a Jewels of India experience in January 2020. Email me if you want to be on the information list. As always, if you enjoy this blog and think that someone you love would find it fun, don’t hesitate to share it (there are small icons for that below). You can also leave me a comment or share a story—after all, that’s what jewelry and travel have in common: they create memories that become stories.